Our Toccoa-Stephens County Chamber of Commerce is once again partnering with The Stephens County Historical Society, with the cooperation of The City of Toccoa to host the 19th Annual Currahee Military Weekend set for the weekend of October 5-7, 2018. Stephens County is rich in military history. Camp Toccoa had over 18,000 soldiers who trained here in four regiments – the 506th, 501st, 517th and the 511th. This is the birthplace of The Band of Brothers, Saving Private Ryan, Saints and Soldiers and The Dirty Dozen. The event serves to celebrate the accomplishments of the veterans who trained at Camp Toccoa. 11:30am–1:30pm Barbecue at The National Guard Armory: Tickets are available at The Chamber/Welcome Center. Local companies are encouraged to pre-order dinners to be delivered to their workplace for their employees. Individuals can purchase tickets at the Chamber or at the door of the Georgia National Guard Armory (located behind Toccoa First United Methodist Church) for eat-in, delivery or take-out. Be sure to get your tickets early! 1:00pm–5:00pm Book Signing at the Historic Train Depot: Come meet the authors of several military books about the paratroopers of WWII, and Memorabilia Show in Downtown Toccoa. 7pm–10pm USO Swing Dance – Reflections @ Lake Toccoa with the David Fry Quartet. Live music, dancing for all ages, and even a dance competition. So come dressed in your best 1942 attire! Food and fun for everyone! Swing Dance lessons at the beginning of the evening. Tickets are $15/each or 2 for $25, and available at the Chamber/Welcome Center at the Train Depot. 7:00am Currahee Challenge: Come experience the 5k and 10k run/walk up the famous Currahee Mountain trail, “3 miles up and 3 miles down,” that served as part of the rigorous basic training where the men of the 101st Airborne were hardened to become the paratroopers who parachuted into Normandy hours before the D-Day invasion. 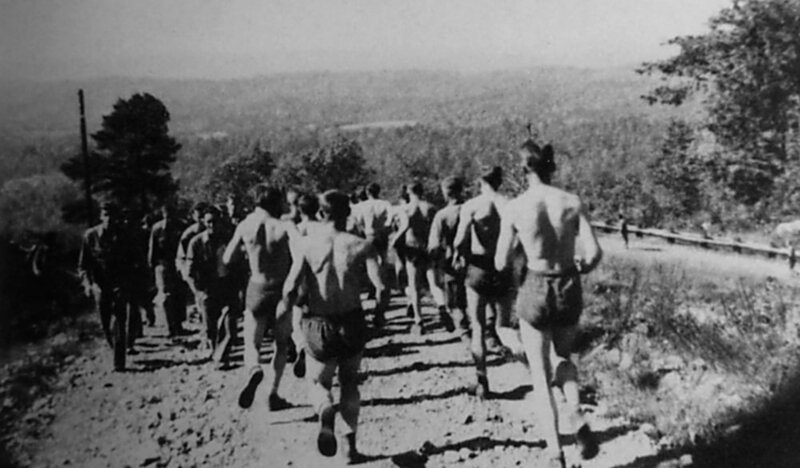 Take the Currahee Challenge…be Toccoa Tough! 10am-4pm Historic Downtown: travel to the 40’s and experience Toccoa during WWII, including a Quarter Faire … fun for the whole family. 8:30am Remembrance Service - Meet at the Parachute Infantry Regimental Memorial – Currahee Mountain.